"However, not everyone is a fan of phakic lenses, and some foresee problems down the road. A surgeon from Utah dislikes them as an option, saying, “The rate of debilitating glare and cataract formation are way under-reported. They all eventually have to be removed if the patient lives long enough and forms cataracts.” Source: Walter Bethke. LASIK: Thin Flaps, Thin Volumes. Review of Ophthalmology. Feb 2015. IMPORTANT: If you experienced problems related to implantable contact lenses, the FDA wants to hear from you. File a MedWatch report with the FDA online. Alternatively, you may call FDA at 1-800-FDA-1088 to report by telephone, or download a copy of the paper form and either fax it to 1-800-FDA-0178 or mail it using the postage-paid addressed form. Read implantable lens injury reports filed with the FDA (enter product code MTA, select a date range, and click search). They go by many names. Phakic intraocular lenses ("phakic" meaning your natural lens remains in the eye) is the generic term for these lenses; however, lens manufacturers and eye surgeons gave the lenses shiny new marketing terms. "Implantable Contact Lens" sounds reasonably safe, right? So, what's this web page doing on a site about LASIK complications? Good question! We're often asked about alternatives to LASIK. Many eye surgeons have begun offering implantable lenses to their patients who are afraid of LASIK or have been found to be an unsuitable candidate for LASIK. But are they safer? Read on to learn why we don't recommend having these dangerous lenses implanted inside your eyes. We enjoy hearing from our readers. Tell us about your experience with implantable lenses. Let us know if you found this web page helpful or if you have a suggestion on how we can improve it. Use the contact form on the menu bar above to contact us. Moya et al. Implantable Collamer Lens for Myopia: Assessment 12 Years After Implantation. J Refract Surg. 2015 Aug;31(8):548-56. 9% of patients lost more than two lines of vision on the eye chart with glasses. 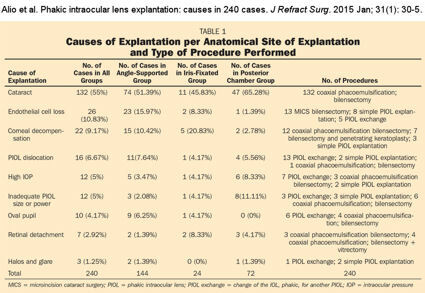 In other words, if the patient could be corrected to 20/20 before ICL surgery, the patient could only see 20/30 or worse with glasses 12 years later. 13.88% of patients developed clinically relevant cataracts [and many more developed milder cataracts]. Endothelial cell density decreased by 19.75%. Endothelial cells are the cells on the back of the cornea that keep the cornea clear. They do not regenerate. If too many cells are lost, the patient may face corneal transplant. From the FDA website: Phakic intraocular lenses, or phakic lenses, are lenses made of plastic or silicone that are implanted into the eye permanently to reduce a person's need for glasses or contact lenses. Phakic refers to the fact that the lens is implanted into the eye without removing the eye's natural lens. During phakic lens implantation surgery, a small incision is made in the front of the eye. The phakic lens is inserted through the incision and placed just in front of or just behind the iris. Are implantable contact lenses FDA-approved? Currently, there are two phakic intraocular lenses approved in the U.S., the STAAR Surgical Company's Visian Myopia Implantable Collamer Lens (MICL) and Advanced Medical Optics, Inc. (AMO)'s Verisyse (also known as Ophtec's Artisan) iris-fixated phakic intraocular lens (IOL). Update: A 9/13/2018 press release by STAAR Surgical states that the FDA approved the Visian Toric ICL for the correction of myopia with astigmatism. Update 5/21/2014: Manufacturer of Visian ICL, Staar Surgical, slapped with FDA warning letter. Update 8/16/2014: We read that the latest design of the Visian ICL has a central hole which eliminates the need for iridectomy. We are uncertain if the new design is currently on the market. Doesn't FDA approval mean it's safe? Industry pressure was key in FDA's approval of LASIK, according to former FDA official turned whistleblower Morris Waxler, PhD. As chief scientist, Waxler oversaw early clinical trials review for FDA-approval of LASIK. He now asserts that the approval was a mistake. Read story. Corneal endothelial cell loss, which may lead to need for corneal transplant. Risk may be greater with an anterior chamber lens. • From page 7 of the Verisyse/Artisan Patient Information Booklet: (content reorganized for clarity). "The endothelium is a layer of cells which lines the undersurface of the cornea, and it regulates corneal water content. The endothelium works as a pump, removing excess water as it is absorbed into the stroma [middle portion of the cornea], the surface behind the epithelium. If the water content isn't regulated, the stroma could become saturated, resulting in a hazy and opaque appearance, which would reduce vision. "Corneal edema occurs when the cornea takes on more water than-it can absorb, which means the cornea swells and becomes less transparent. Endothelial cells play a role in keeping the cornea healthy. The available 3-year data from the clinical study indicates a continual steady loss of endothelial cells of -1.8% per year and this rate has not been established as safe. If endothelial cell loss continues at the rate of 1.8% per year, 39% of patients are expected to lose 50% of their corneal endothelial cells within 25 years of implantation. The long-term effect on the cornea's health of a 50% loss in comeal endothelial cells is unknown. However, if too many cells are lost you may need a corneal transplant. Therefore, it is very important that your endothelial cell density is periodically monitored. "Based on the data obtained from the clinical study of the ARTISAN® Phakic IOL, it is impossible to predict the effect that this IOL will have on the corneal endothelium." Complications After 1st Week: loss of cells from the back surface of the cornea responsible for the cornea remaining clear (endothelial cell loss, 8.9% at 3 years). WARNINGS: The long-term effects on the corneal endothelium have not been established. You should be aware of potential risk of corneal edema (swelling) possibly requiring corneal transplantation. Periodic checks of your endothelium are recommended to monitor the long-term health of the cornea. • From page 115 of FDA Presentation: Mar. 14, 2014, which states that the post-approval study of the Visian myopia implantable collamer lens demonstrated endothelial cell loss of 11% at 5 years. Six percent of eyes had endothelial cell loss greater than 30%. • This 2011 literature review found that cataract was the most common complication of posterior chamber intraocular lenses, reported at a rate of 5.2% of eyes implanted. Of those, 43.4% were reported within 1 year, 15.4% between 1 and 3 years, and 35.3% three or more years after after ICL implantation. Cataract surgery was carried out in 27.9% of eyes with induced cataracts. • Early acute intraocular pressure increase is reported frequently after phakic IOL implantation. Pupillary block glaucoma can occur due to occlusion of aqueous flow between the lens and the iris. This is a dangerous situation which may lead to permanent vision loss if not detected and remedied immediately. In this small study, pupillary block glaucoma occurred in 5.8% eyes within the first postoperative day. 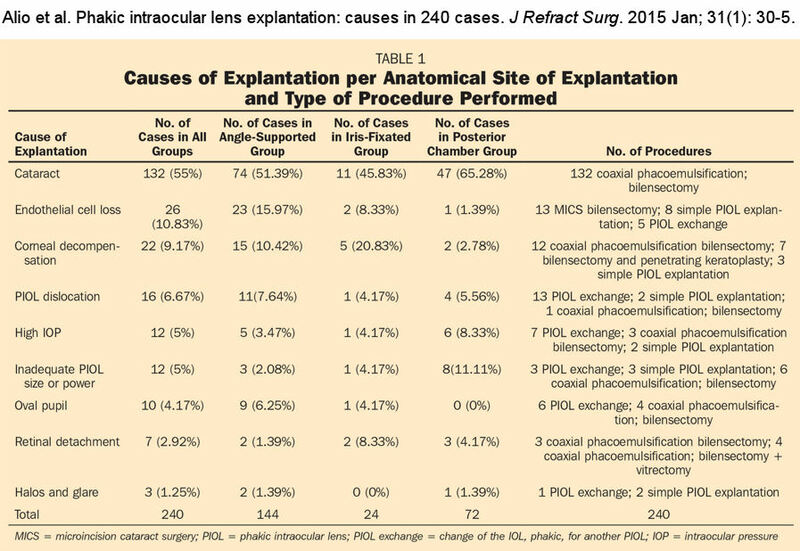 An article published in the January 2015 issue of the Journal of Refractive Surgery reports causes of explantation of phakic intraocular lenses. See chart from article below (click to enlarge). What about large pupils and implantable lenses? Complaints of night vision problems and visual disturbances have plagued the refractive surgery industry from the beginning. Implantable lenses are no different. The FDA website says you are probably not a good candidate for phakic lenses if you have large pupils. (Keep in mind, the FDA works hand in glove with eye surgeons whose livelihoods are dependent upon selling unnecessary surgery.) We would say you are definitely not a good candidate for phakic lenses if you have large pupils. How large is too large for ICL surgery? 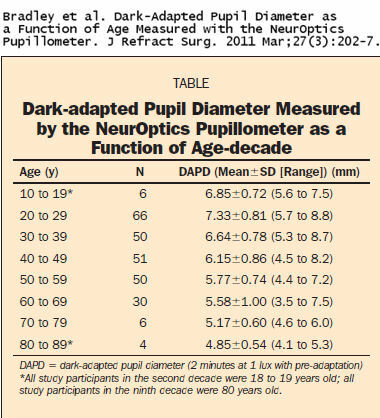 Generally speaking, if your dark-adapted pupil diameter exceeds the lens optic diameter, you're not a good candidate. The Visian ICL labeling states that the lens features an optic diameter with an overall diameter that varies with dioptric power; the smallest being 4.9 mm optic diameter/12.1 mm overall diameter and the largest 5.8 mm optic diameter/13.7 mm overall diameter. The Verisyse lens is available in 5 mm and 6 mm optic diameters, according to the company's website. You're going to have to ask some probing questions of your eye surgeon to determine if your pupil size makes you a poor candidate. 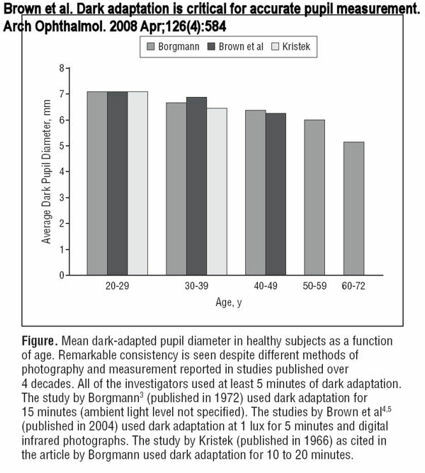 Be sure to have your pupils measured in the dark after a period of dark adaptation, and repeat this measurement on a different day. Based on these findings, a large percentage of patients should be disqualified for implantable lenses. Follow the latest research on PubMed.gov. Had STAAR/Visian ICL implanted August 30 and October 9, 2012. Prior to surgery eyes were -9.75 and -10.25 diopters w/ astigmatism but eyes could accommodate. After surgery vision was 20/30 right and 20/50 left, but lost ability to accommodate, necessitating bifocals. In October 2013 noticed slight blurring of both eyes. In December 2013 original surgeon diagnosed cataracts both eyes. Right eye vision deteriorated significantly since then; surgery to extract ICL and cataract from right eye scheduled for November 13, 2014 with new surgeon. No risk of cataract discussed prior to surgery; STAAR/Visian materials state risk of cataracts is less than 1 percent. Disclaimer: The information contained on this web site is presented for the purpose of warning people about complications of LASIK, implantable lenses, and other forms of refractive surgery prior to surgery. Patients experiencing problems should seek the advice of a physician.